Children love bright and colourful wall decorations. This set of Jungle themed wall decals for kids is an ideal addition for a child’s bedroom with a central jungle design scheme. What’s especially appealing is just how easy it is to attach the stickers to any wall surface and how simple and tidy it is to peel them off when required. Not only that but each animal decal can be reattached somewhere else, multiple times, without leaving a sticky residue. 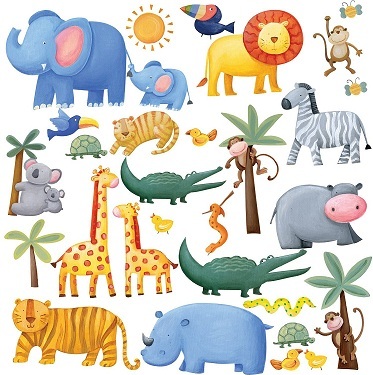 These quality wall stickers (26 in all) include a variety of animals children associate with the exotic jungle scenes from books and movies. There are alligators, lions and tigers (a little imaginative license), monkeys, an elephant and zebra, giraffes, hippos and rhinos. There’s also a warm glowing sun and palm trees to complete the look. You and your children can have a wonderful time deciding where each jungle themed wall decal will go and after a week or two, you can do it all over again! You can buy the set from here: Jungle Adventure Peel & Stick Wall Decals . Jungles present a fascinating design theme for children and adults alike. 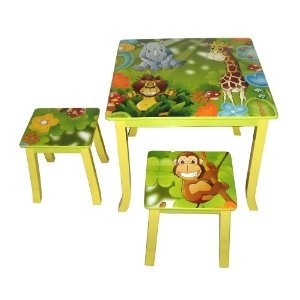 This wooden jungle themed table and chair set for little kids is just such an example. Jungles are full of exciting animals, often with unique and beautiful markings, shapes and colours. There are hundreds of ways to design a room of any kind using this particular subject framework as inspiration and each one offers a myriad of fun accessories for children and even their parents. A table and chair set is a valuable furniture piece to have in a kid’s playroom or bedroom. It allows a child the freedom to explore their creativity in drawing, reading, writing and playing whilst sitting at a comfortable height and in a way suited to their smaller dimensions. This table and two accompanying chairs can be situated in a variety of rooms including even, a kitchen or dining room where it can be used for meal times. Made from strong pine wood, each item in the set has been given a non-toxic paint finish which means, as well as keeping the wood safe, it’s also extremely easy to simply wipe clean after any spills. Whether your children are painting, piecing together jigsaws, reading from a book or eating lunch, they will find great pleasure from being seated at such a vibrantly designed table. Friendly-looking jungle animals can be seen smiling against the backdrop of green flora and fauna. There is, as is often the case with children’s designs, a little artistic licence to be had with the addition of a few animals nor normally associated with such a habitat but this doesn’t in any way detract from the exciting theme. Kids are naturally attracted to faces and so these fun animals will trigger their imaginations and allow them to enter into the world of jungle playtime. Recommended age-group: 36 months – 8 years. A jungle themed bedroom is an exciting decor option for any parents with young children. For those that live in urban areas, the desire to bring some nature and exotic scenery into the home is often increased. With a jungle themed bedroom decor scheme, your child will not only gain an exciting environment in which to play but also a pathway to learn more about the natural world. Passions and hobbies that we carry on throughout our lifetimes are more often than not formed in some small way during childhood. For this reason, it is important to give children as many chances as we naturally can to discover the world around them, whether in the local area or on the other side of the world. Western children will only see jungles on television and in picture books but with a little decor adjustments and design, their whole bedroom can become the very environment they found so fascinating. Monkeys, parrots, lions, snakes and jaguars are all creatures found in the jungle scene. Each one can provide an exciting opportunity for learning. As well as this, all of these animals’ very form and coloring can provide marvellous inspiration for the design of bedding, wall murals, paintings, furniture and general bedroom accessories.